Hi, I am interested in your 1965 Ford Mustang (stock #136404) listed on Autotrader for $69,900. I'd like to get more information about this vehicle and confirm its availability. 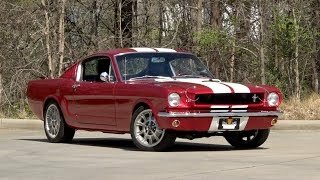 Ground Up Built Mustang Fastback Restomod 302 V8 5-speed 9in Leather /// The beneficiary of a professional, ground-up restoration that combines solid metal with tailored aesthetics, this well done Mustang wears a rich coat of Ford Laser Red 2-stage. That paint looks great under Pearl Shelby top stripes. Those stripes are an excellent complement to a pinned, Shelby-style hood. All the cars emblems have been carefully shaved, with the exception of a bright pony insignia that rides a classy mesh grille. Fresh chrome and stainless includes clean bumpers, factory handles and a duo of small mirrors. And those awesome bolt-ons terminate, quite literally, with a stylish Mustang GT rear valance. Hoist this coupes glossy hood and youll find 302 cubic inches of proven Ford power that was professionally assembled by the folks at Upland, Californias VanGordon Performance. That engine twists torque through a Tremec T5 5-speed that was sourced directly from D&D Performance. That transmission spins a Bill Thomas Enterprises 9-inch thats finished with 3.50 gears, 28-spline axles and Traction-Lok differential. That axle pushes a traditional Mustang suspension thats been augmented with a 1-inch sway bar, KYB shocks, 620 front springs and 5-leaf mid-eye rear springs. Turns come easy thanks to modern power assist. Dual-circuit braking employs 11-inch slotted SSBC rotors in front of factory drums. And everything rolls on California Pony Cars alloys, which twist Continental ContiExtreme Contacts in front of General Exclaim UHPs. Between the doors, firm TMI seats are adorned in red-stitched Pony covers. A dual-cowl dash plants rebuilt factory telemetry between direct-fit audio, Auto Meter accessory gauges and a Scott Drake Rally Pac. Fade-free carpet floats Mustang-themed floor mats between a polished shifter, a small console and 6-inch Kicker speakers. And the driver spins a handsome Grant steering wheel. Call, click or visit https://www.RKMotors.com for more information!